The foodie wanderlust in me spiked after seeing a whole bout of delicious-looking bubble tea pictures that plagued my Instagram feed. With brown sugar drizzled all around the cup, the drink looked almost too good to drink. 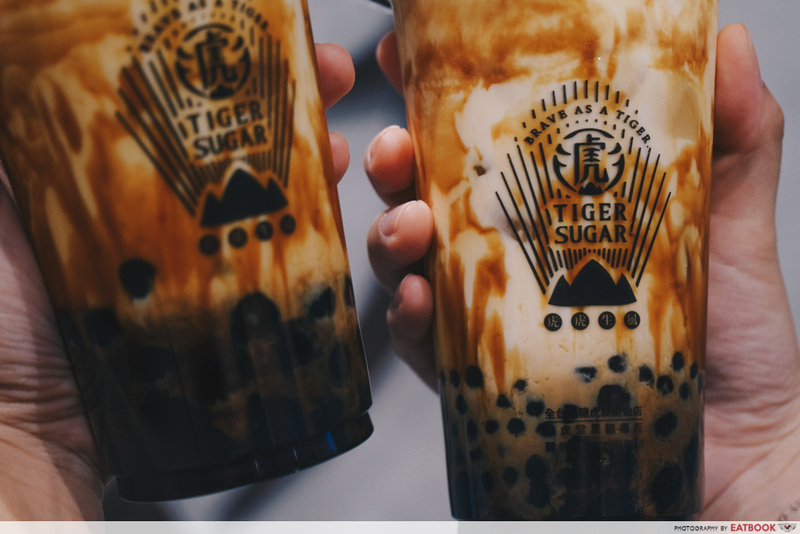 The Tiger Sugar craze started when they first opened in Taichung just last November. Thankfully, the famous brown sugar drink made their way to Singapore before I caved in and bought a plane ticket to them. With bated breath, I received my Brown Sugar Boba + Pearl with Cream Mousse ($5.30). 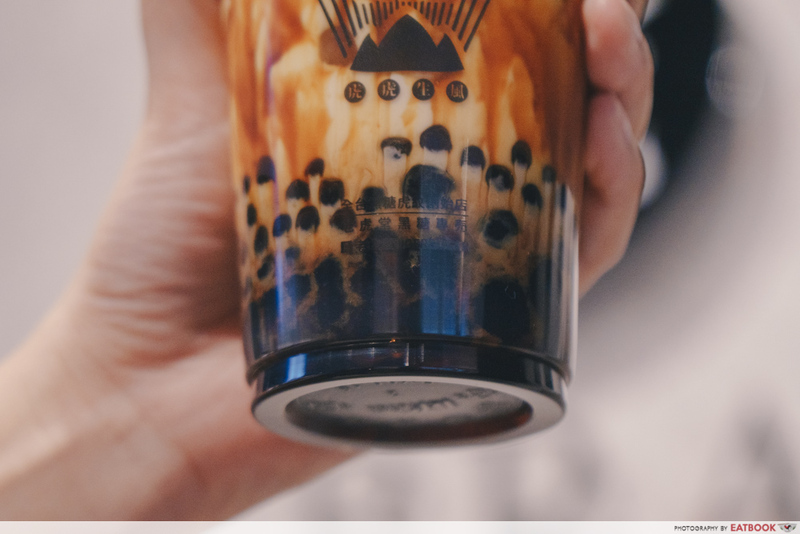 It was oddly satisfying as the cup was cold on top but warm at the bottom – one of the reasons their brown sugar boba and pearls are so popular. This concoction comprises a layer of brown sugar syrup followed by large bobas, mini pearls, ice cubes, fresh milk, and cream mousse. Snap a quick picture of that beautiful emblematic pattern on the sides of the cup before it gets mixed. Just like fingerprints or the stripes on a tiger, no two Tiger Sugars have the same drizzle. The people behind the drink have done their R&D, and recommend giving the drink 15 shakes before stabbing your straw straight down into the creamy goodness. I don’t know why 15 to be exact, but it seems to do the trick. The boba and pearls are truly a cut above the rest. 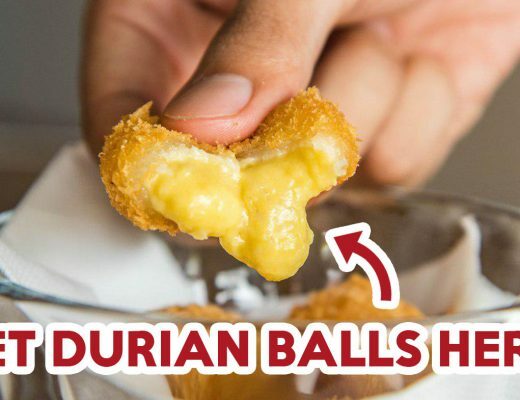 These globes of starch are soft and chewy, totally lacking that firm centre you find in pearls elsewhere. I also loved how there were larger bobas mixed with mini pearls. The mini pearls brought a fun and novel element, while the bobas gave a good chew each mouthful. 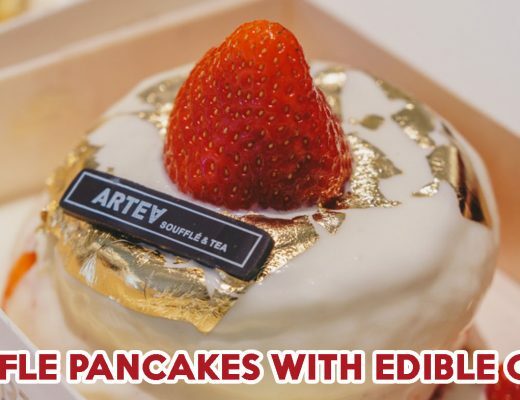 This combination, when paired with the clean yet rich flavour of cream and milk, was quite simply glorious. The cafe echoes its ethos of using only the finest ingredients, and everything but the ice are imported. 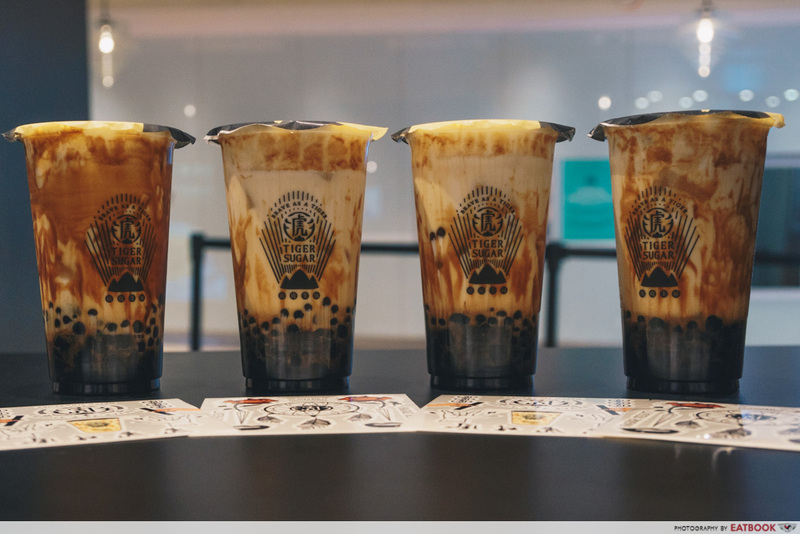 Those who want a lighter taste can order either the Brown Sugar Boba Milk ($5.30) or Brown Sugar Pearl Milk ($5.30), which comes without a dollop of premium cream mousse atop. I highly discourage this as it’s the thick cream which gives the drink a savoury, and almost cheesy taste. Unlike many other bubble tea shops, there are no sugar options to choose from here. Leave it to the professionals to present the combination they deem best. 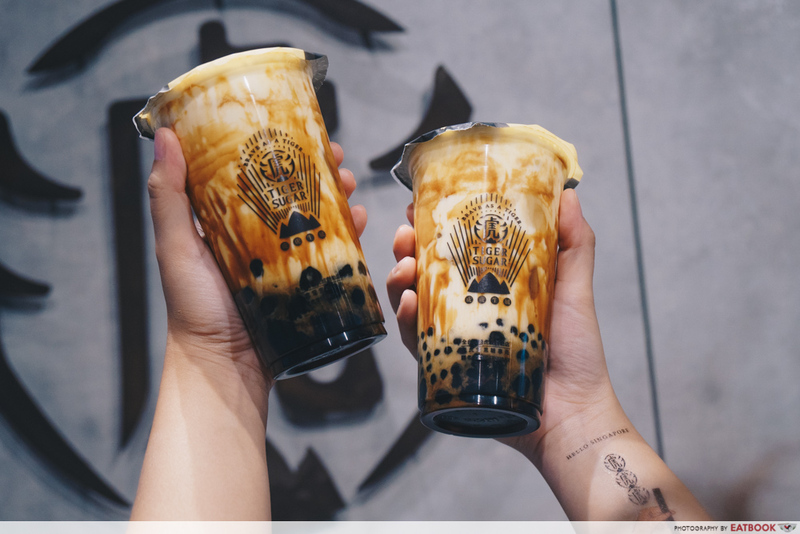 If you’re looking to have your daily dose of caffeine, be sure to also try out other drinks on the menu such as Brown Sugar Green Tea with Boba ($3.90) and Black Tea Latte ($4.30). The outlet at Capitol Piazza is one of their biggest ones yet. 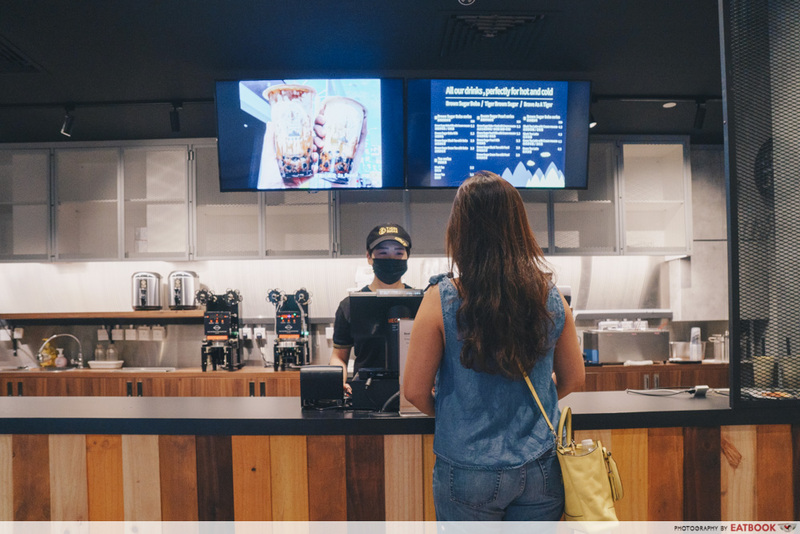 Featuring more than just a takeaway counter, there are even photo walls to take a quick boomerang or two before the signature tiger stripes disappear into the milky abyss. 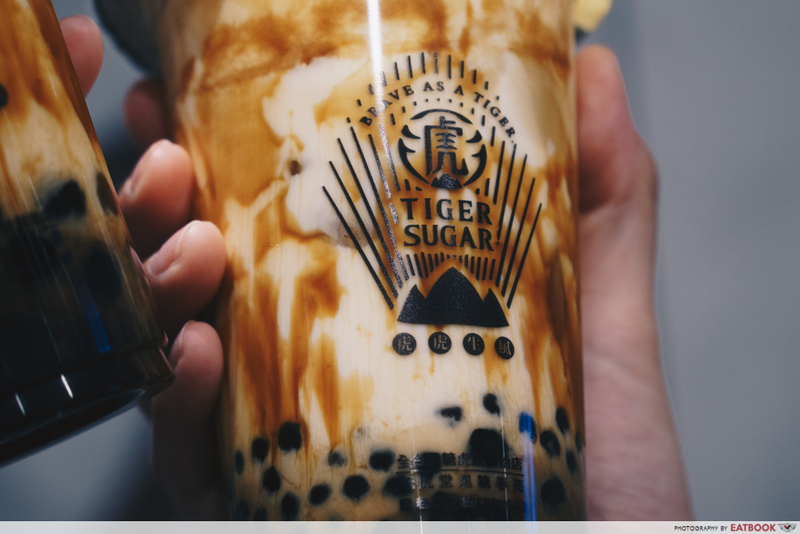 I’ve always wondered how people can actually queue more than 30 minutes for bubble tea, but after trying Tiger Sugar’s signatures, I would gladly stand in line for more fresh milk and boba. 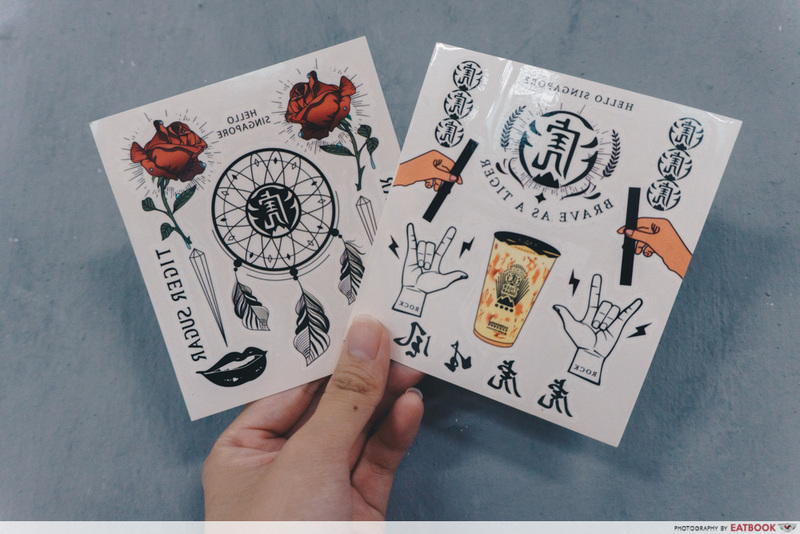 Be one of the first 200 people in line from Saturday, 3 November, till Tuesday, 6 November, to get your hands on these exclusive tattoos! 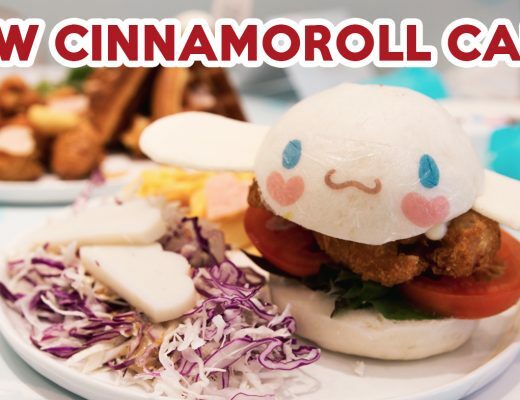 If you’re looking for more fancy tea shops that have opened in Singapore, check out Playmade for their handmade flavoured pearls, or Bobii Frutii for Instagrammable layered drinks. Tiger Sugar will be opening their doors this Saturday, 3 November at 11am. This was a media tasting at Tiger Sugar.